CO molecules spontaneously become spatially ordered and oriented at a low-temperature salt crystal surface. Remarkably, they behave like an ensemble of gas-phase molecules; when vibrational energy is deposited into the CO bonds, the salt is nearly a spectator and the energy redistributes between the CO molecules, pooling into a few CO molecules at the expense of all the others. 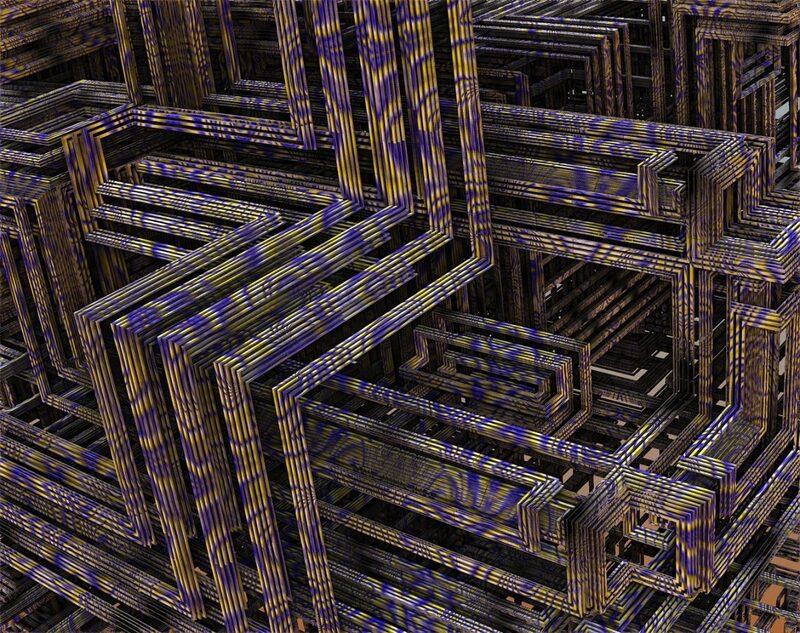 A great deal of exciting quantum physics is presently carried out using optical lattices created by periodic electric fields from interfering laser beams; but, what if the periodic electric fields at the surface of a cleaved salt crystal could serve this purpose? With this in mind, we set out to find a system where the adsorbate-substrate coupling is as small as possible. In that effort, we have found the first example of energy transfer between an adsorbed molecule and the solid to which it is adsorbed that is mediated by the radiation field and not by the chemical adsorbate-substrate bond? The manuscript “The Sommerfeld ground-wave limit for a molecule adsorbed at a surface” describes these observations. 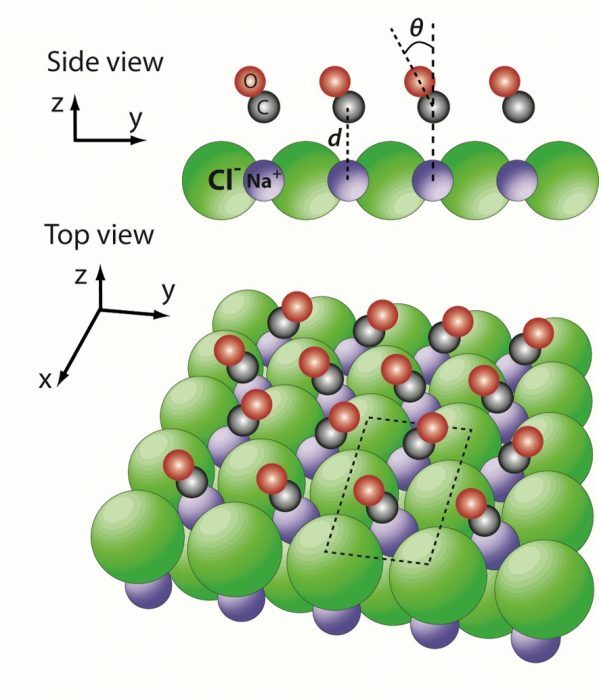 CO adsorbed on a NaCl(100) crystalline surface behaves like an ensemble of closely of ordered and oriented gas phase molecules. From Chen et al., SCIENCE 363:158, 11 Jan 2019 (10.1126/science.aav4278). Reprinted with permission from AAAS. In 1909 Sommerfeld explored the physics of radio communication beyond the horizon. He modeled an oscillating point-dipole interacting with a half-space with homogeneous index of refraction and derived the mathematical basis for ground waves. Ground waves allow radio communication beyond the horizon without a line of sight. In 1974, Chance, Prock and Silbey (CPS) extended this theory to include near field effects and could then describe how a molecule’s radiative lifetime changes with distance from a reflecting and absorbing solid, successfully explaining the landmark experiments of Drexhage, Kuhn and others, which placed molecules in the vicinity of a mirror surface using an inert spacer layer. In this paper, we show that vibrational relaxation of CO(v≲20) adsorbed to NaCl obeys the predictions of CPS. Despite the absence of a spacer layer between the molecule and the substrate, vibrational energy transfer from CO to NaCl proceeds solely via the infrared radiation field analogous to Sommerfeld’s ground-wave picture. This is the weakest mechanism of coupling between the vibrations of an adsorbate and the solid to which it is bound, an interesting limiting case where the interatomic forces normally so important to the dynamics of energy flow can be completely neglected. For dipolar adsorbates that find themselves within the Sommerfeld ground-wave limit, the strength of dipole-dipole interactions between the adsorbate molecules far exceeds the adsorbate coupling to the solid. These findings are described in the article entitled The Sommerfeld ground-wave limit for a molecule adsorbed at a surface, recently published in the journal Science. Sommerfeld, The broadening of the waves and the wireless telegraph. Ann. Phys.-Leip. 28, 665-736 (1909). R. R. Chance, A. Prock, R. Silbey, Lifetime of an emitting molecule near a partially reflecting surface. J Chem Phys 60, 2744-2748 (1974). Alec Wodtke obtained his Ph.D. at the Univ. California Berkeley, USA (1985) and has conducted research at the Max Planck Institute for Fluid Dynamics Göttingen, the Univ. Kaiserslautern, the Catholic University of Nijmegen in the Netherlands, and as a professor at the Univ. California, Santa Barbara (1988-2010). He is a full professor (since 1996), Director and Scientific Member at the Max Planck Institute for Biophysical Chemistry and a professor of Physical Chemistry at the Univ. Göttingen (since 2010). Dr. Wodtke has won numerous prizes and awards, among them the Presidential Young Investigator Award of the National Science Foundation, the Humboldt Research Award, (1998) and an Alexander von Humboldt Professorship (2010).